Featured ring consists of a slightly larger centre diamond. Each diamond is set in six claws – made up with an elegantly twisting band. Trust and confidence the two most important things when you are looking to buy diamond jewellery. At Madison we hand select each diamond for our three stone rings, giving you the reassurance that each stone will be a perfect match, whichever combination of diamonds you choose. 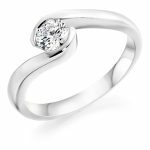 All our jewellery can be made in platinum 18ct yellow and white gold in our own workshop to meet your needs.